Those words, spoken by a San Francisco firefighter, still haunt Ramon Valle, whose business was completely destroyed in the four-alarm fire of January 28th at Mission and 22nd streets. 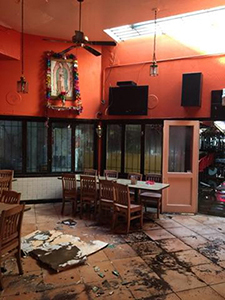 As Ramon wandered through the smoldering ashes of Taquerias La Alteña, he pondered the over 15,000,000 other minutes he had toiled to create a successful business, his labor of love for over three decades. All up in smoke. “I still feel like I will wake up and this will all have been a bad dream,” laments Ramon. A good dream began 36 years ago, when Ramon left his homeland of Mexico for the opportunity of a better life north of the border. He landed in San Francisco, with the Mission District his neighborhood of choice–the same choice made by innumerable others from Mexico and Central America, both decades before and after Ramon. Taquerias La Alteña was a popular place for old-timers and newcomers alike, a melting pot of the Mission community queuing up daily. Latinos would bring their little ones to sample the cuisine the former remembered from their own youth. Many tech workers, recently drawn to the Mission because of ventures exactly like Taquerias La Altena, could be seen devouring a hearty burrito, an authentic taste most could not find back home. All were drawn by heaping plates of hot food true to its roots, complemented by the warmth of a quick-to-smile staff. Sadly, these numerous employees are now in limbo, wondering when they can return to the venue that felt more like home than a workplace. Ramon does have a plan–a plan to return to the building where he has been since the mid-1980’s, and one in which he has a seven-year lease in place. This transition time is key for his business’ survival. While Ramon’s storefront is now concealed behind a black canopy, the sign for Taquerias La Alteña is still visible on the Mission Street side of the now boarded-up edifice. The sign stands as a beacon of hope. Hope for Ramon. Hope for 35 other businesses owners and their 71 employees. Hope for the Mission maintaining its longtime vibrancy and identity. Nearby, festooned on a streetlight, is a sign that proclaims, “Shop Small.” This banner also survived the fire, but without the community’s support, these words may soon be moot on the corner of Mission and 22nd streets.